I remember the word that made me fall in love with music. I was only 8 years old when my mom was watching Much Music and a new music video came on. Three longed haired boys were singing the most beautiful song I had ever heard. Not only did I fall in love with music in that moment but I discovered my first ever butterflies in my tummy for the cutest drummer I had ever seen. People either loved or hated Hanson. I spent the majority of Grades 2 either defending my love for this band or arguing why I was a better fit for Zac than my other Zac loving friends. My mom spent hours on the phone to get me tickets to see them play at the Molson Ampatheatre, my very first concert. 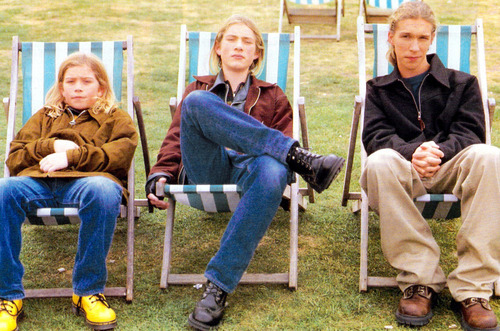 My walls were plastered in Hanson posters from floor to ceiling and every diary entry involved either song lyrics, band facts or justifying why Zac could love a girl even if she was three years younger. I did chores and begged and pleaded and saved up every penny I could to buy my very own pair of Yellow Doc Martens so I could be like my first crush. I got them and wore those boots everyday even through the teasing of my classmates. They obviously didn't know what cool was. Hanson is way more than just MmmBop which seems to shock a lot of people. Hanson does in fact still exist and some of their best songs are from the last couple of albums. They've released 6 studio albums, a Christmas cd and several EPs. They're also very clever businessmen, started up their own record label & have 11 kids between them. They also have one of the most loyal fanbases I have ever seen. I have to admit, I am more of a born again Hanson Fan. They have always been my favourite band but before August 2014 I hadn't seen them play since 1997 which would be totally unacceptable to those loyal Fansons. I actually even turned down a guaranteed meet and greet with the band in 2011! I was busy being a kid, falling in love with my husband and having babies to really dedicate too much time to being a die hard fan. Until I went to a free show at the CNE in Toronto August 2014 and every single emotion I felt at 8 years old came flooding back. I was consumed again, these Hanson boys are like a drug I tell you. The energy they give off at a show is unreal. So when I heard Hanson was coming for a two night show & after party in Toronto on Thanksgiving Weekend 2015 I knew I had to go, regardless of the fact that I would be missing my favourite Holiday. As soon as the tickets were released my good friend Adriana, who is as Hanson obsessed as I am, was on the computer getting us tickets. We talked about how amazing this weekend would be on the nightly & played over different scenarios of meeting our favourite band, convinced we would finally meet our favourite band after 18 years of love for this band. Basically we became those little girls back in 1997 all over again. We made arrangements for the 7 kids we have between us and set off to Toronto for what we hoped would be the best Hanson Weekend of our lives.